Presented as a thoughtful, poetic exchange between two characters -- who don't realize they are thinking and asking the very same questions -- this beautiful celebration of our humanity and diversity invites readers of all ages to imagine a world where there is no you or me, only we. If the first step toward healing the world is to build bridges of empathy and celebrate rather than discriminate, Why Am I Me? helps foster a much-needed sense of connection, compassion, and love. 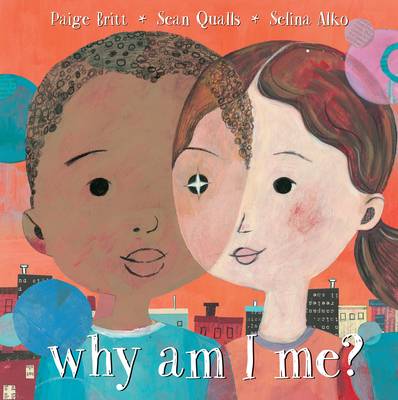 Paige Britt has been asking big questions since she was a small child. Her search for answers led her to write books that might inspire young readers to think, explore, and stay open to life’s mysteries. Her debut novel, The Lost Track of Time, was hailed by Publishers Weekly in a starred review as an “exuberant homage to the power of imagination.” Why Am I Me? is her first picture book. She lives near Austin, Texas, with her husband. Visit her online at paigebritt.com. Selina Alko has always been curious about different people and cultures, which stems, in part, from growing up with a Canadian mother and a Turkish father, who spoke seven languages and taught her to paint. Her art brims with optimism, experimentation, and a deep commitment to multiculturalism and human rights. She is the author of The Case for Loving, which she illustrated with her husband, Sean Qualls, and the co-illustrator, also with Sean, of Two Friends by Dean Robbins. She has written and illustrated several other acclaimed picture books, including Daddy Christmas & Hanukkah Mama and B Is for Brooklyn. She lives in Brooklyn, New York, with her family. Learn more at selinaalko.com. Sean Qualls finds inspiration everywhere, from old buildings, nature, fairy tales, black memorabilia, and outsider art to cave paintings, African imagery, mythology, music, and his native Brooklyn. He is the co-illustrator, with his wife, Selina Alko, of the celebrated picture books Two Friends by Dean Robbins and The Case for Loving by Selina Alko. Other acclaimed picture books he has illustrated include Giant Steps to Change the World by Spike Lee and Tonya Lewis Lee, Little Cloud and Lady Wind by Toni Morrison and her son Slade, Dizzy by Jonah Winter, and Before John Was a Jazz Giant by Carole Boston Weatherford, for which he received a Coretta Scott King Illustrator Honor. He lives in Brooklyn, New York, with his family. Visit him online at seanqualls.com. PEOPLE ARE RAVING ABOUT WHY AM I ME? "An ordinary trip home becomes a journey in wonder and compassion." "[A] perfect blend of words and images… took my breath away." "I love the vibrancy of the illustrations." "Selina and Sean's paintings bring this love story gloriously to the page… I felt like I had been dropped right into the center of everything. Loved it! " "Gentle illustrations that capture a timely theme: the value of empathy."